Los Angeles (AP) – Go ahead, pick your favorite young, villain-vanquishing fantasy heroine. Meg Murry probably came first. Katniss Everdeen? She arrived in 2001. Hermione Granger? That was 1997. Elphaba, the green girl from “Wicked”? 2003. But Meg, the reluctant, bespectacled heroine of Madeleine L’Engle’s classic “A Wrinkle in Time,” has been with us, and on the shelves of middle-schoolers, since 1962. Enter Ava DuVernay, tapped by Disney to put her own spin on this tale of self-discovery across the space-time continuum, for the big — REALLY big — screen. Talk about pressure. And the talented “Selma” director does not shy away from the task of adapting the story to the 21st century. With the help of a terrifically diverse cast anchored by the sweet — but too sweet, here — newcomer Storm Reid, and A-listers like Oprah Winfrey and Reese Witherspoon, DuVernay has made a film that is unabashedly — some might say relentlessly — of the moment. Hip-hop quotes, eating disorders, a “Hamilton” reference? Yup, yup, yup. It’s also all over the map, in every way possible. It’s visually gorgeous at times but then boring to behold at others, emotionally poignant at times but stunningly cloying at others. It’s also confusing (though to be fair, many might call the book confusing, too.) Mostly, it’s just a frustrating whole comprised of some pretty promising parts. We begin, as “Wrinkle” fans surely know, with that “dark and stormy night.” It’s been four years since Meg’s beloved father, a physicist, disappeared mysteriously. Dad (not really the nerdy type we imagined from the book, but it’s Chris Pine so, OK) had been exploring serious issues involving time travel. And now he’s gone, leaving Meg (Reid), her mom (Gugu Mbatha-Raw) and precocious little brother Charles Wallace (Deric McCabe) wondering if they will ever see him again. The outside world is dismissive, including the school principal, who flat-out tells Meg her dad probably won’t be coming back. Meg has problems at school — she’s said to be aggressive and troublesome, although frankly, this is hard to see from Reid’s appealingly thoughtful, sweet demeanor. When Meg throws a ball into the face of the reigning mean girl, Veronica, landing her in the principal’s office, it seems strangely out of character. In any case, soon Meg, Charles Wallace and friend Calvin (Levi Miller), whose quirky character has sadly been turned into a blandly handsome nothing, will be on their journey, via a time travel concept called a tesseract (verb: tessering), to find Dr. Murry. Accompanying them on this perilous quest, at various stages, is a triumvirate of very entertaining older women, er, celestial beings — Mrs. Whatsit (Witherspoon), Mrs. Who (Mindy Kaling) and Mrs. Which (Winfrey). Witherspoon is the most engaging of the bunch — ditzy and charming and, at 2,379,152,497 years of age, the youngest of the group. Winfrey’s Mrs. Which is the grande dame, imposing with dramatic white hair, sparkling lips and eyes in various hues, and gems across her forehead, exhorting Meg to be a warrior in tones that recall the late poet Maya Angelou; Winfrey has said she was channeling both Angelou and the good witch Glinda. Would that Winfrey could speak Angelou’s own words, though, rather than the often hollow lines she’s given by screenwriters Jennifer Lee and Jeff Stockwell. Kaling’s character is the least compelling, maybe because she’s “evolved past language” and thus only allowed to spout quotes from others, a diverse bunch that includes Buddha, OutKast, Kahlil Gibran, and Lin-Manuel Miranda. After an initial stay on the ravishing planet Uriel, and a visit to the Happy Medium (a comic Zach Galifianakis, clad, as he notes, in earth tones), the kids end up on the frightening planet of Camazotz, ruled by the dark force called It. Their time here is the most visually interesting of the film, especially the scene of scarily alike children bouncing the same balls at the same moment outside the same houses. Here, they will find Dr. Murry, but their journey will put Charles Wallace in grave danger, and Meg will be called upon to decide just how brave she can be. In case you haven’t read the book, we won’t get more specific. But if you have, beware that some elements — including a pretty major plot twist involving Meg’s road to heroism — are either compressed beyond recognition (as in a tesseract, perhaps) or deleted altogether. The ultimate themes, though, remain the same: Love can cut through anything, including time and space. And smart girls rock! And our individuality — including our faults — is what makes us strong. 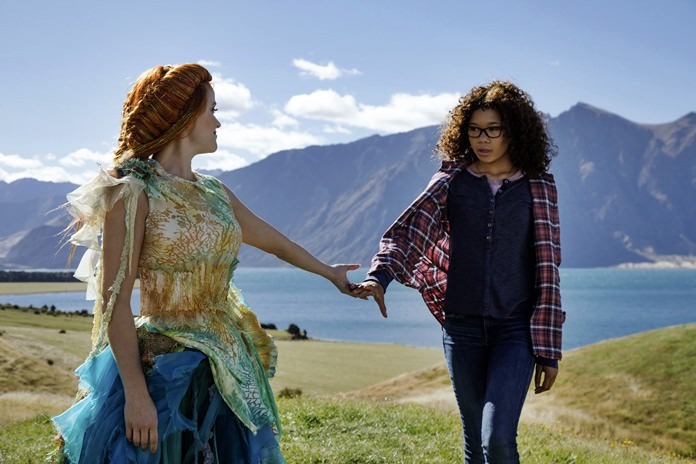 While the faults of this film decidedly do not make it stronger, maybe its well-meaning spirit will be enough to appeal to a new generation of Meg Murry fans. “A Wrinkle in Time,” a Walt Disney Studios release, has been rated PG by the Motion Picture Association of America “for thematic elements and some peril.” Running time: 109 minutes. Two stars out of four.